We had been driving for just under an hour – most of which had been spent with me commenting on every little thing by the side of the road that I noticed. In between sipping on my rosehip juice and mineral water after the great supermarket moment in Migros. Most of the puppets were snoozing on the back seat – but that energizer-bunny-known-as-Karagöz was just biding his time, bouncing on the middle part of seat, occasionally bumping into Hacivad (who was, apparently, meditating) or the others. His verbalizations mainly consisted of “wheee – we’re free!!!! !” I was ignoring him in some ways – but his energy source with the “whee” was certainly enabling my excited-ness about finally being on the road with M.
So there were were, driving along the highway, and I was revelling in being able to OBSERVE – something I have done with my family on road trips since childhood. We used to go out to the Peking Garden – a Chinese-American eatery near our home, and spend the meal in almost silence – just looking around us. Then, once safe in the confines of the car, we would each tell our stories about our “take” on the person around us. Sound pathological? Well, maybe, I was raised by a team of academics. If nothing else, this kind of nutty activity taught me to enjoy and learn from everything around me – and perhaps is what led to my undergraduate studies in anthropology. 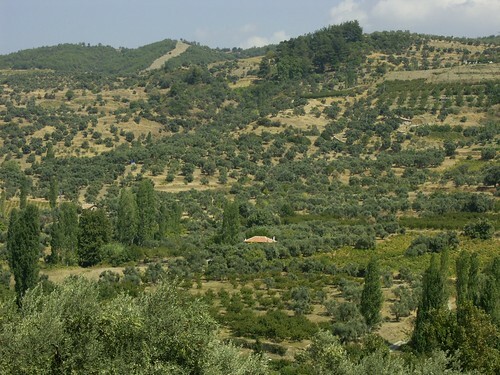 Of course, throughout this, my first trip to Turkey to meet M.’s family, my anthropological lens was on high-usage-rotation as I encountered lots of new phenomena. As the car sped through the arid but lovely countryside, avoiding pot holes and at least two traffic pile-ups along the way, I chattered on and on. “Look – why are there only women in the field?” I would exclaim. M. would usually give a short answer along the lines of “awful, I know, it’s what they do here” before reverting back to silence. I would keep chattering. Perhaps trying something like “this looks sort of like Southern Minnesota, have you been there?” or “how lovely the golden light is on the grassy hillsides! Does it remind you of a time in your childhood? 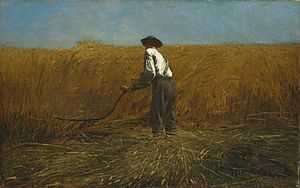 What about a Winslow Homer painting? Do you like Winslow Homer?” There is nothing I love more than the kind of unexpected conversations on a road trip that feel like basic banter but can lead to revelations and a depth newly reached with your travel partner. I had been SO excited for this trip – especially given some of the difficult moments in Bodrum – I could barely contain myself from pushing the conversation all over the globe to engage in the kind of conversation I loved. I was silent for a time. Reading my mind, because of course, he was part of my mind, Hacivad spoke. “Do not worry that he is in some way inhabiting some macho, male protector role. Yes, this is likely a facet of his cultural upbringing. Is it lethal, no. Is it loving, yes. Is it meeting your need to talk as you go through the journey? No. You may just have to live with that.” I wasn’t ready for the latter. I could even get into the idea of a boyfriend that loved and respected me enough to want to assure safety for the night. Isn’t that what good people do? Yes. I decided. Of course it is! What is the matter with me for even thinking this is some weird macho-ness. But the no talking on road trips? Where was the fun in that! Isn’t life about the observation along the way? Apparently M.’s parents did not engage in the same lokanta-based activities as mine had. Well, I thought, let me try the radio if he doesn’t want to talk. “OK if I turn on the radio, dear?” I asked as I simultaneously hit the “on” button. “Do I have a choice?” M. joked as the crackling of static filled the car and woke most of the puppets up temporarily. “Sure,” he said, “just don’t play any of that modern Arabesque music – I hate it more than anything. Try to find some REAL Turkish music.” Hmm. I thought. “I am not sure the difference? Can you tell me?” The next five minutes of the trip were spent going from station to station – all of which, M. told me, were unacceptable, as they did not cease with the Arabesque music and the “incessant wailing and clanging” as M. referred to it. At every stop on the radio dial, Karagöz sang along loudly and off-key – he seemed to know the words to everything and clearly he, as was I, was kind of into this music. I felt glad that M. could not hear Karagöz. What the little lady chorus of puppets later told me, is that Hacivad had booted Karagöz out the window as I began to sleep, so that he would not interrupt the indoctrination process. Don’t worry about this perceived violence. As wax paper puppets, the shadow puppet troupe is quite resilient. They have all been known to fly off into a cactus, gully or Aegean bay once in a while, only to emerge like new lickety split. This is one of the distinct benefits of being the manifestations of someone’s inner thought chaos. This entry was posted in Cross-cultural learning moments, Visits from the Karagöz puppets and tagged Arabesque, Bodrum, conversation, Gülben Ergen, istanbul, Karagöz and Hacivat, Migros, navigation, Orhan Gencebay, Turkey, United States, Winslow Homer. Bookmark the permalink. . . here I understand M; my need when driving is for 120% concentration and is absolute! We have a selection of BBC radio comedy shows that help to break up long journeys – a bit of chat is OK but I find it hard to stay tuned in for long. Something to do with ‘focussed awareness’ (men) and ‘diffused awareness’ (women).